This dump cake recipe is a very easy cake recipe that you can put together in just minutes. No mixing bowls are involved. All the ingredients are dumped in layers into a baking pan. If you have never made a this cake before, you will not believe how such a quick, easy recipe can taste so good. A cross between a cake and a cobbler, it is especially tasty when served with a scoop of ice cream or whipped cream. 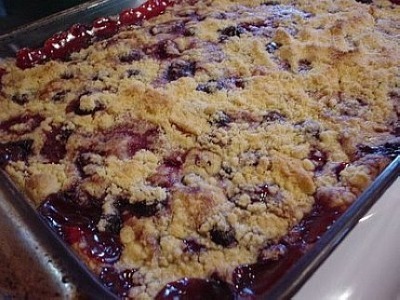 The best part of this recipe is that you can vary the flavors of fruit pie filling and cake mixes to make many different dump cake recipes. For a July 4th cake, use a white cake mix, one can of red cherry pie filling and one can of blueberry pie filling. Cinnamon and spice apple pie filling and whole berry cranberry sauce combined make a delicious Thanksgiving cake. Chocolate cake and cherry pie filling are perfect for a special Valentine’s Day or Christmas dessert. The choices of canned pie fillings and cake mixes are many. Get the kids involved in making this easy kid’s recipe. They will have fun helping you Dump this Cake! Dump canned pie filling over bottom of pan, spread evenly. Using a spoon, dump the pineapple with juice evenly over pie filling layer. Sprinkle dry cake mix evenly over pineapple layer. Drizzle melted butter or margarine over cake mix. Sprinkle coconut and pecans over top. Bake for 1 hour. Remove from oven and let cool in pan. To serve, scoop Dump Cake onto serving plate or bowl with a scoop of ice cream or a dollop of whipped cream.